I’ve written before about being at a dead-end trying to determine the parents of my 4x great-grandmother Mary Brown (1816-1853). Recently many new records have come online from the meetings of the Quakers (they call themselves “the Friends”) in the 1800’s. 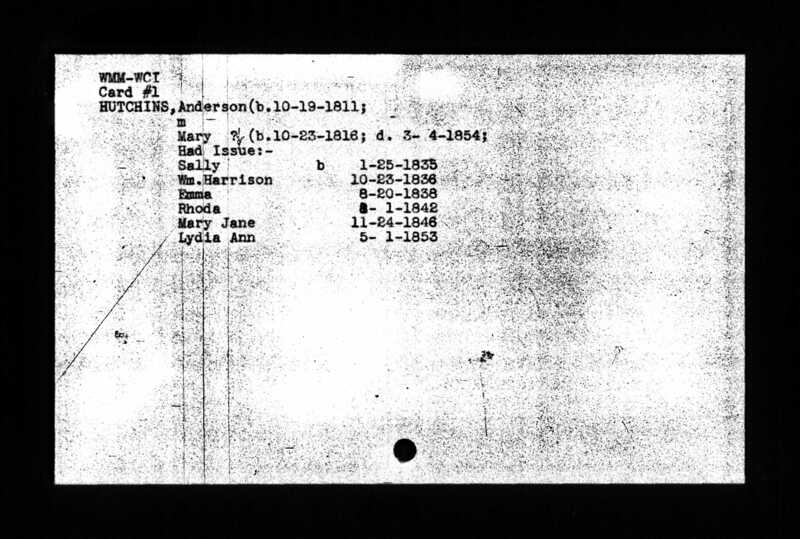 Two new documents have shed some light on Mary’s parents. 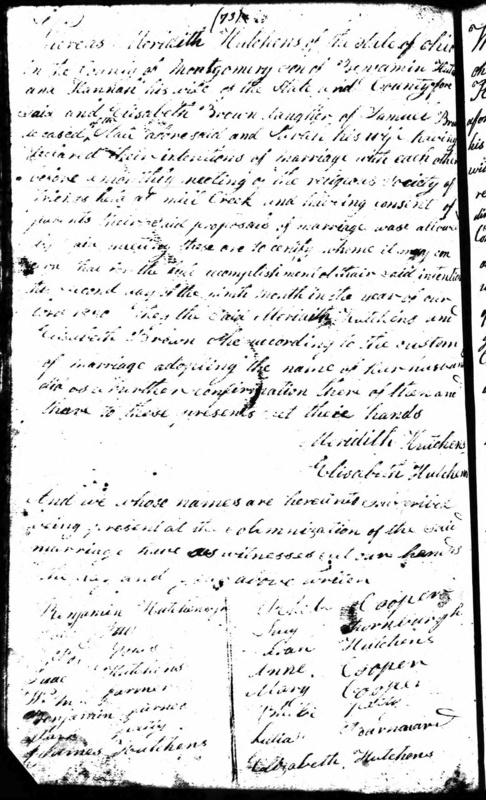 “Whereas Meridith Hutchins of the State of Ohio in the County of Montgomery, son of Benjamin Hutchins and Hannah, his wife, of the State and County afore-said, and Elizabeth Brown, daughter of Samuel Brown, deceased, of the State afore-said and Sarah, his wife, having declared their intentions of marriage with each other before a monthly meeting of the religious society of friends here at Mill Creek and having consent of parents there said proposal of marriage was allowed of by said meeting. These are to certify whom it may concern that for the full accomplishment of their said intentions this second day of the ninth month in the year of our lord 1830 they, the said Meridith Hutchins and Ellizabeth Brown, according to the custom of marriage adopting the name of her husband did as a further confirmation then and there to these presents set their hands. Meridith Hutchens, Elisabeth Hutchins. And we whose names are hereinto subscribed being present at the solemnization of the said marriage have as witnesses put our hands the day and year above written. 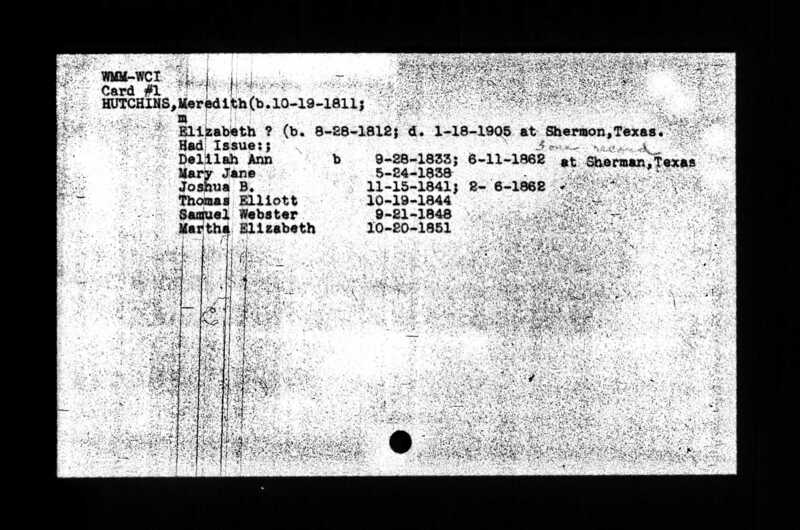 So this document gives the name of Elisabeth’s parents as Samuel & Sarah Brown. This matches a notation I had found on a Rootsweb tree for my grandmother Mary Brown. It says her father was deceased and that her parents were from Ohio. Another Meeting of Friends entry from 20 Sept 1830 indicates, “Friends appointed to attend the marriage [of Meridith & Elisabeth] saw nothing disorderly.” Which is comforting. Martha Elisabeth Brown was born 28 Aug 1812 in Ohio and died 18 Jan 1905 in Sherman, Texas at the age of 92. I’ll have to try to find her death record to see if her parents are mentioned. There are many more leads to follow up on now. Hopefully something new will shake out as a result.